Drizzy takes the “most streamed” crown on the platform for a second straight year. Drake was the most streamed artist on Spotify in 2016, after topping the list last year as well. His 4.7 billion streams this year more than doubled last year's total of 1.8 billion, largely thanks to the success of VIEWS and "One Dance." Naturally, those took the titles for most streamed album and song of the year on the platform, respectively. Earlier this year, "One Dance" passed Major Lazer's "Lean On" for the most total streams ever on Spotify, and is now up to almost 970 million plays. 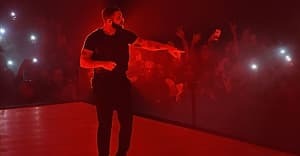 Drake is in fact the most streamed artist in the platform's history, with over 8 billion streams in total. Other major players this year included Rihanna, Justin Bieber, 21 Pilots, and Kanye, who rounded out the top five artists (and albums) for 2016. Behind the strength of "Work" and ANTI, RiRi clocked over 2.5 billion streams on the year. Among other fun details from Spotify's press release: witch house is apparently a hot "emerging" genre and Eminem's "Till I Collapse" is still apparently a very popular workout anthem. More info, stats, and playlists from 2016 here, via Spotify.